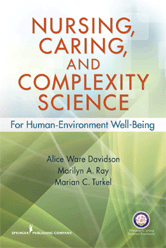 This innovative volume explores nursing and complexity science, and investigates how they relate in research, education, and practice. The book examines best methods for using complex systems, with expert contributing authors drawn from nursing, sociology, informatics, and mathematics. Each author is actively involved in studying and applying complexity science in diverse populations and various settings-especially in terms of nursing, chronic care, health care organizations, and community health networks. Chapters conclude with a response written by a nursing scholar, administrator, or practitioner, focusing on chapter concepts relevant to the complex systems seen in nursing. Chapters also include models that relate how these concepts can be used in practice, management, education, and research-from micro to macro scales. The first of its kind, this book demonstrates the potential of complex systems perspectives in nursing and health care research, education, and practice.